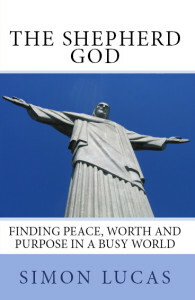 ‘The Shepherd God:Finding Peace, Worth and Purpose in a Busy World, published by Crossring, is now available to buy in both paperback and Kindle format. Links for both editions in the US and UK Amazon stores are provided below. I hope that you enjoy reading the book and find it a useful and helpful read. If you do, please consider writing a review for Amazon. “Psalm 23 is one of the most well-known and best loved passages in the Bible. But how often do people stand back and really think about the words? “What Simon Lucas does in this book is work through the psalm, at each point drawing out some helpful implications for us today. For example, what does it mean to say “the Lord is *my* shepherd”? It was also good to see how Psalm 23 is fulfilled in Jesus Christ – another aspect which many may gloss over. “The book itself is set within the framework of Simon’s own experience of depression, much of the book is related to his personal experience. As such, I would particularly recommend it for people who are struggling at the moment with hard times. “Each chapter feels like a sermon (not a criticism! ), and at the end of each chapter there are some questions to think about. As such I think the book may be useful for use in home groups or the like as a discussion starter. Back to ‘The Shepherd God’ home.